Your Wedding day. Marriage is such a beautiful experience. Savor it, enjoy every day of it, grow with it. Every wedding couple is unique. Together we can create your personalized wedding ceremony that celebrates your special day, your way. Performing weddings is very rewarding to me. It gives me the opportunity to meet a variety of people, assist them in creating their ceremony and then meeting their family, friends and guests. I personally benefit from the words, inspirations and positive energy that comes from weddings. I am a non-denominational officiant. I will make the couple the focus of the ceremony. I am not there to preach or evangelize. It is your special day and I will work with you to make your wedding a day to be remembered. As an ordained Clergy I will solemnize your marriage, complete your marriage certificate and submit your license to the County Clerk. I can also assist in coordinating the events of the day. I am very organized, punctual, friendly and persuasive. These are all qualities that are needed to pull off the big day. I offer a variety of ceremony styles and vows created just for you. I will perform anything from a simple "elopement" ceremony to a traditional chapel ceremony. The style of ceremony is yours entirely. Religious, Spiritual or Non-religious ceremonies, Contemporary, Involving Family, non-denominational... all of my ceremonies are meaningful and beautiful to make your wedding memorable. I have experience in photographing weddings, issuing marriage licenses and organizing rehearsals and ceremonies. I am the founding member of NW Wed Pro networking association. My business relationship with many of the Northwest's top wedding and event professionals helps me to better serve you and also refer quality vendors. It would be my honor to perform your wedding, elopement, vow renewal or commitment ceremony. LGBT friendly and supportive. you must obtain your marriage license prior to getting married. In the State of Oregon there is a 3 day waiting period unless you obtain a waiver. Obtain the license in any County Clerk's office in the State you wish to be married in. Bring the license to your ceremony. The application does not become a license until the County receives your $60.00 payment for processing. 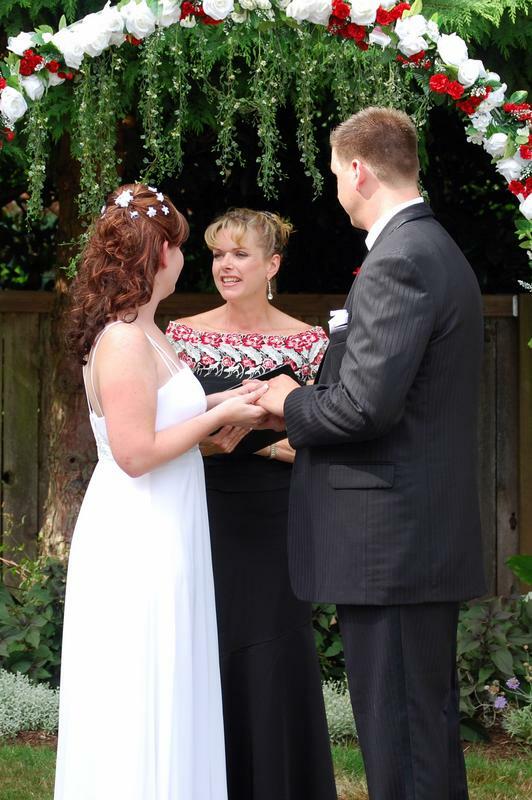 Radiant Touch Wedding Officiant & Minister The perfect person to perform your wedding ceremony. Ask me about any of these locations for wedding and receptions: Washington Park Rose Gardens, Bell Tower Chapel, Pioneer Church at Baker Cabin, Gray Gables, Sara Hite Memorial Gardens, Silver Falls State Park, Abernethy Center, Broetje House, Keizer Heritage Foundation, McMenamins Grand Lodge, Cornelius Pass Roadhouse, McMenamin's Edgefield, East Fork Country Estate, Postlewait Farm, Sah-Hah-Lee Golf Course, Pacific Crest Grand Ballroom, Kell's Irish Pub Ballroom, Portland White House, Brooks Hill Historic Church, Oaks Pioneer Church, Persimmon Golf Club, Willamette Valley Vineyards,Oregon Golf Club, Aerie at Eagle Landing, Ainsworth House, Abiqua Farms, Oregon Gardens, Kruger's Farm, Skamania Lodge, Deepwood Estates, St. Josef's Vineyard, McLean House, Cedar Springs Country Estate, Atkinson Memorial Church, Mason Ballroom, Postlewait's Country Wedding, Highcliffe Ballroom, Aurora Colony Vineyards, Knollcrest Gardens, The Foundery, Oswego Pointe, Persimmon Country Club, Oregon Golf Club, Oregon City Golf Club, Weddings on the Hill, Abernethy Center, Oregon Territory Museum Tumwater Room, Wonser Estate, The Old Church, The Lake House, Lucy's Garden, and many more. All Photos and weddings in this video are by Beverly Mason of Radiant Touch Weddings.